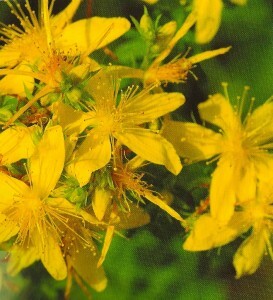 Once used by Ancient Greeks and Romans to ward off evil spirits, St John’s Wort is used today as a natural anti-depressant, a gentle alternative to conventional medications and with far fewer side effects. An analysis of studies of St John’s wort revealed that the herb is as effective as regular anti-depressant drugs in the treatment of depression that is mild to moderate. Herbal supplements are made from the dried flowers of the plant, which is a shrubby perennial with bright yellow blooms. The flowers contain a number of therapeutic substances, including a healing pigment called hypericin. Used to treat mild to moderate depression, as well as anxiety, stress, obsessive-compulsive disorder, PMS and menopause. Aids treatment of enuresis and vitiligo. In cases where depression is manifested as extreme tiredness and low energy levels, the herb promotes sound sleep. It enhances GABA – a natural tranqillizer in the brain; it is believed to boost levels of serotonin, the brain chemical that is a key in mood and emotion enhancement. St John’s Wort is also a traditional remedy for wounds, and in Germany it is used in oily preparations to treat minor injuries such as bruises and burns. Pregnant or breast-feeding women should not take St John’s wort. St John’s wort is available in tablet, capsule, dried herb, liquid and oral spray forms. It is not used for domestic and culinary purposes. Native to Europe, western Asia and North Africa, St John’s wort spreads by means of its creeping underground stems and seed dispersal, and in South Africa is classified as an invasive species, competing with and replacing indigenous and pasture species.